With its space-themed attractions, major concerts, and cozy cafés, Kaluga makes for a perfect day trip from Moscow. Kaluga, a city with a population of 325,000 may seem quiet at first glance. However, it was here, near the banks of the Oka River, that great thinkers formulated important ideas about the cosmos. A great daytrip option from Moscow, Kaluga is for the ideal destination for space lovers. For those less interested in rockets, the city is also full of provincial charm, with its ancient churches and hip cafes. In addition, visitors can find several interesting festivals and parks nearby. Kaluga is located 150 km southwest of the Russian capital. There are many ways to get to Kaluga, including commuter trains (elektrichki) with about 6-7 running per day, and practically all long-distance trains that head towards Ukraine or Moldova, at least 10 every day. All trains leave from Kievsky train station and the journey takes 2-3 hours depending on the schedule. Kaluga is easily accessible by car and bus as well. Kaluga, founded in 1371, is a relatively old city for Russia. It was created as a buffer fortress on the southwestern borders of Muscovy’s territory, a predecessor to the modern Russian state. Ivan the Terrible paid a visit in the sixteenth century at the head of armed forces on their way to battle the Tatars. Supposedly Prince Gustav of Sweden spent a year here around 1600 (when he would have been about four). Tsar Boris Godunov brought Prince Gustav to Kaluga. At the time, the Tsar was in the thick of the Time of Troubles (1598-1605), a brief, but chaotic period in Russian history. Kaluga played an important role during the War of 1812 as a supply center and headquarters for Russian forces coming from the south. After retreating from Moscow, Napoleon initially headed in the direction of Kaluga, but after the Battle of Maloyaroslavets (in modern-day Kaluga region), the invading army was forced to flee in the direction of Smolensk along a road that had been destroyed by French forces on the way in. Before Siberia became infamous as a place of exile for troublemakers, Kaluga filled that role. Kaluga housed important prisoners. Khan Shahin Girai, the last Khan of Crimea, was a modernizer in his brief reign, initiating reforms in the economy and the structure of government. However, he succumbed to pressure from the Russian Empire, spending part of 1786-1787 in the city under house arrest, before being sent on to modern-day Moldova. The Kyrgyz sultan Arigazi-Abdul-Aziz spent 10 years here, during which he married the 16-year old daughter of a Moscow merchant and died in 1833 of fever. He was buried behind the Old Believer’s cemetery, which is now Kaluzhsky Bor, a forest just outside of town. Imam Shamil, leader of the liberation forces of Dagestan and Chechnya that fought against Russia during the Caucasian War, and the last imam of the Caucasus, capitulated to Tsar Alexander II in 1859 and was exiled to Kaluga. He lived in a large stone house at Pushkinskaya Ul. 4 from 1859 to 1868 before being granted permission to move to Kiev. Kaluga can be easily seen in a day, but for those looking to spend the night, the Hotel Vintazh is an affordable, modern and central option with rooms starting at 3500 RUR per night (Ul. Teatralnaya 17a). The Georgian Princess Thecla was sent to Kaluga after a coup aiming to restore an independent Georgian monarchy was discovered. Arriving with her sons in 1834, she was allowed to return to Georgia less than a year later. Kaluga’s official motto is, “The Cradle of Space Exploration,” and all of the energy in the town today seems to emanate from the almost superhuman brain and imagination of Konstantin Tsiolkovsky (1857-1935). Considered today to be one of the founders of rocketry and astronautics, Tsiolkovsky philosophized in relative obscurity here, teaching at a small provincial school and living in a log cabin. He was largely self-taught, because elementary schools would not admit him as his hearing was impaired after catching scarlet fever at age 10. His neighbors viewed him as a strange recluse. However, without him, it is questionable how far rocketry and space exploration would have progressed, not just in the Soviet Union, but around the world. The author of more than 400 works, Tsiolkovsky is now Kaluga’s most famous resident. As a result of his discoveries, many landmarks, buildings, and parks in Kaluga are named after him, or after Yuri Gagarin, the first man in space, or are inspired by general outer-space themes. It is not uncommon for a beauty salon in Kaluga to be called kosmos (space) or a supermarket called luna (moon). One such place worth visiting is Gagarin Bar, found appropriately enough at Ul. Gagarina 4. There are two locations in town where the legacy of Tsiolkovsky shines especially bright. The Tsiolkovsky State Museum of the History of Cosmonautics claims to be the first museum on earth to specialize on the history оf space exploration. Gagarin came here in June 1961—just two months after making his space orbit—to lay the inaugural stone; the museum opened six years later. There are two main exhibits. The first is dedicated Tsiolkovsky’s ideas and the second centers on space vessels. There is also a planetarium on the second floor and a rocket park on the riverside of the museum. It is located at Ul. Akademika Koroleva 2 (http://www.gmik.ru/index_en.html). Nearby the museum is an enormous obelisk, which sits on top of Tsiolkovsky’s grave. Those who want to know even more about the man should head to the Tsiolkovsky Memorial House, where he lived for 29 years until his death in 1935 (Ul. Tsiolkovskogo 79). If you’re still curious about Tsiolkovsky, you can continue on to the town of Borovsk about 86 km north of Kaluga to visit the Tsiolkovsky Memorial Apartment, where the great thinker lived for 18 months in 1887-1888 (although he lived in Borovsk for 12 years). This museum focuses on his childhood and early discoveries made in the 1880s and 1890s. There are so many statues of Gagarin and Tsiolkovsky and murals representing space that it is difficult to know where to begin your explorations. One must-see site is the statue commemorating Kaluga’s 600 th birthday on the banks of the River Oka at the bottom of Ul. Gagarina. Featuring Gagarin’s head in flames dangling from a mast overlooking earth below, it also memorializes Tsiolkovsky nearby. For the architecture buff, the Kaluga Kosmodamianovsky Church is probably the oldest surviving example of old Kaluga architecture. First mentioned in the chronicles in 1626, this church originally featured four bell towers. Shortly after the Revolution of 1917, the two priests here were arrested and sent into exile for anti-Soviet agitation: one was executed several years later, while the other’s fate remains unknown. During Stalin’s repressions in the 1930s the church served as a prisoners’ holding pen. It was returned to the Orthodox Church in 1992 (Ul. Suvorova 177/16). Be sure to take a walk through Ul. 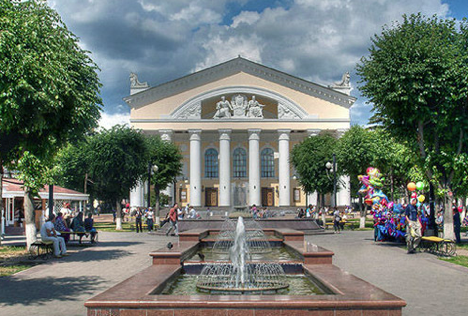 Teatralnaya, a pedestrian street that begins at the city’s main Drama Theater. On weekends the avenue is flooded with strollers and crowded with tables selling souvenirs. At Teatralnaya Ul. 9 is the Tsiolkovsky loft space, featuring freelance offices, an art gallery and a large “time café,” a popular café concept in Russia, where the limited menu is free, and customers pay for their time instead. This one is very spacious and features a large outdoor balcony overlooking a stone courtyard. Kaluga is a musical town, filled with karaoke clubs and live music venues. If you’re looking for venues that serve food, stay open late and frequently host out-of-town acts, head over to Pub Overtime (Ul. Glagoleva 3, 3 rd floor, www.facebook.com/overtimepub.ru) and Bar Mazhor (Ul. Kirova 50, www.barmajor.ru) One of Kaluga’s mysteries is that it is seemingly the Russian capital of flamenco. No one seems to know why, but there are concerts held most months of the year, often at the Regional Philharmonic Theater, which recently hosted the Mir Gitary (World of Guitars) festival. This year’s lineup featured masters from Argentina, Chile, Australia, France, Canada and the United Kingdom and was dedicated to Paco de Lucía, the Spanish flamenco virtuoso. The city’s premiere cultural venue is located at Ul. Lenina 60 (www.kof-kaluga.ru). Perhaps due to its proximity to Moscow, and because of its significantly more affordable land, Kaluga Region hosts a number of interesting festivals and projects and, in the near future, perhaps Moscow’s fourth airport. Plans have been in the works for several years to build a fourth airport for Moscow in Yermolino, a town near the large university and science town of Obninsk on the grounds of an existing landing strip. Located 80 km beyond the MKAD, it would primarily service budget airlines. Dikaya Myata is an annual folk and ethnic music festival that usually takes place around the June holidays. Founded in 2008, Dikaya Myata originally changed locations every year, although has been held the last four years at Etnomir, an open-air ethnographic park in Kaluga Region. When it is finished in 2020 it will be one of the largest such parks in the world and will feature the participation of dozens of countries from around the world, with architectural examples of structures of various cultures, different camps, music festivals and a spa and resort (mintmusic.ru and http://mintmusic.ru/ethnomir). About 70 km northwest of Kaluga is Nikola Lenivets, an art park and functioning organic farm, featuring festivals of architectural installations, new media conferences and a marathon. It is open to visitors, volunteers and interns and features camping options, cottages and a hostel on site (http://nikola-lenivets.com).